The current method for accurately monitoring sleep, a polysomnography, involves the patient sleeping in a sleep clinic, covered in electrodes. With obvious drawbacks to this method, researchers are looking for cheaper, lightweight alternatives that interfere less with patients’ sleep. One such alternative is ear-EEG, here, Dr. Kaare Mikkelsen tells us about this form of sleep monitoring and his research published in BioMedical Engineering OnLine. Photo of one of the ear plugs that the participants wore. The metal dots are silver electrodes, the plastic is a soft silicone. Later iterations are more sophisticated with fewer and better electrodes. A lot of people feel that they sleep poorly. Or, at least, a lot of people wish they slept better, possibly more. How people sleep can often be important in understanding or diagnosing a particular illness. This is the case in obesity, chronic pain and in particular many mental or cerebral illnesses. However, it is not easy to actually determine how well a person sleeps, and, if their sleep is suspicious, in what particular way. The conventional method is through a polysomnography, in which the subject wears about 12 electrodes placed around the head, and often a few scattered around the body as well. In serious cases, they will also spend the night in a special sleep clinic. 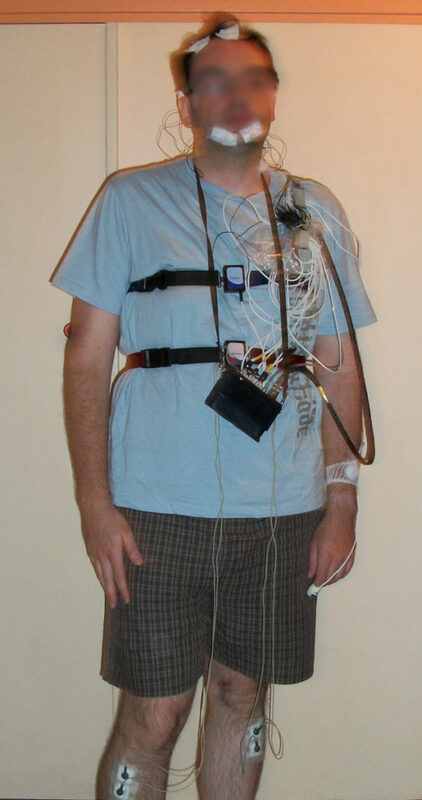 A man wearing a full polysomnography setup. Photo taken from Wikipedia (By GAllegre - Own work, CC BY-SA 3.0,). – It’s expensive (the equipment is expensive, and you need a trained person to set the whole thing up). – It’s not particularly comfortable to sleep with, and many people feel uncomfortable having their head covered in wires, electrode glue and often a hair net. – In many cases you can’t even use data from the first night’s sleep (precisely because people sleep even worse than usual when wearing it). Add to this that many sleep disturbances won’t be present every night, so perhaps the screening has to go on for even longer, with the person having to come back in every day to have the electrodes put back on! Because of this situation, there is a general interest among biomedical engineers and sleep researchers in creating an alternative to the polysomnography; a cheaper, lightweight alternative that the person being screened can put on themselves, and which interferes less with the thing being measured (i.e. the sleep). Several research groups and companies have decided to focus on placing electrodes on the exposed skin in or around the ears (check out Wikipedia for examples of ear-EEG). Our group at Aarhus University in Denmark are among the frontrunners in this field (though by no means the only ones), and were the first to publish a detailed study on the possibilities of using ear-EEG to monitor sleep. In our study: 9 people were equipped with both polysomnography and ear-EEG, and spend the night in their own beds. Afterwards, we used the ear-EEG measurements to automatically (using a computer algorithm) score their sleep, meaning that we determined at what time of night they were in different sleep stages (REM sleep, deep sleep etc.). We then measured how much our ear-EEG based sleep scoring agreed with the clinician’s scoring, when she used the polysomnography data. Example of the correspondence between a clinician’s scoring of polysomnography data, and the automatic scoring based on ear-EEG recording. Red lines mark ‘REM’ phases, which is when most dreaming occurs. Figure taken from the paper. We found a very good correspondence. In particular, we found that if we allowed the algorithm to fine tune to a particular person, the results were almost as good as a human expert using the much more detailed measurements from the conventional polysomnography setup. The results were almost as good as a human expert using the much more detailed measurements from the conventional polysomnography setup. We also found that if we only cared about when the participants were asleep or awake, the results were almost perfect – much better than what can be achieved using just a smartwatch or a smartphone. This is, obviously, very good news. We can imagine that in the future, light weight EEG could be used by many people with suspected sleep disturbances, or who possibly have some illness which presents itself through distinct changes in sleep. Imagine that these people would simply receive a set of ear plugs in the mail, which connects to their smart phones, and after two weeks they send back the ear plugs, and their physician will know exactly how they sleep, much more precisely than if they had used a sleep diary, and much more comfortably (and cheaply!) than if they had to come in each day for two weeks and have a polysomnography mounted. Of course, this is not a miracle fix – mobile EEG has the significant caveat that it does not pick up signals from the entire brain equally well. Our study only shows that it seems to do quite well for normal sleep in healthy people. Most likely it will have difficulties with some disorders, for which it will likely only be able to show that “something is wrong”, but not what. Still, we expect that within the next decade, hopefully in the first half of it, there will be several, good methods for recording sleep (and brain activity in general) at home, and that this will be a valuable tool for clinicians. Dr. Kaare Mikkelsen is a post doc at the Department of Engineering at Aarhus University. His research concerns developing a mobile EEG solution for tracking sleep outside of the clinic, and, in a broader perspective, methods for leveraging unlabeled EEG recordings, such as those from a mobile device. He maintains a twitter profile and his institutional webpage.